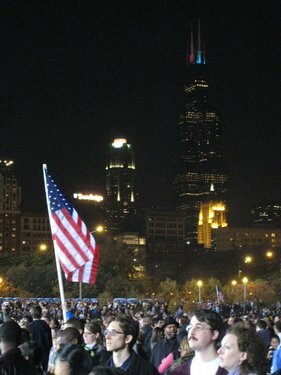 There were a quarter million people downtown celebrating on November 4, 2008 but I made it into the paper! Well, sort of: my friend Sarah found a picture of me in the user-submitted section of the Chicago Tribune’s online coverage. You’re up to #22 now in the Grant Park photos. It’s so great that you were there. Even though the emotions will fade, I don’t think you’ll forget; it’s one of those moments that everyone seems to what to share how they experienced the transition. I do, indeed, think it represents a huge transition for the world. Hope and change are so right to characterize what’s coming and already here in seed form. You are so lucky to have been there. Fantastic shot, just fantastic. Kourtney, Aaron, and I spent the night partying at the intersection of Martin Luther Blvd and Adam Clayton Powell in Harlem. An awesome moment. Fantastic shot, just fantastic. Kourtney, Aaron, and I partied the evening away at the intersection of Adam Clayton Powell and Martin Luther King Blvd in Harlem. An awesome moment.